If your PRIVATE well water has tested positive for coliform or E. coli bacteria you can safely disinfect the well system using household bleach by carefully following the instructions below. These instructions can also be used to shock chlorinate your well system if you have problems with iron bacteria. Note: The use of household bleach for disinfecting PUBLIC water supplies is not allowed. Only use the amounts of chlorine recommended for shock chlorination of iron bacteria if you have a significant iron bacteria problem. Be aware that these procedures may loosen sediment, rust, and biofilm deposits within the well system, causing temporary problems with sediment, rust particles, discoloration and plugging of filters. CAUTION: Liquid chlorine bleach can be hazardous! It is a strong oxidizing agent. Prolonged contact with concentrated bleach can cause corrosion of well casing and well equipment. 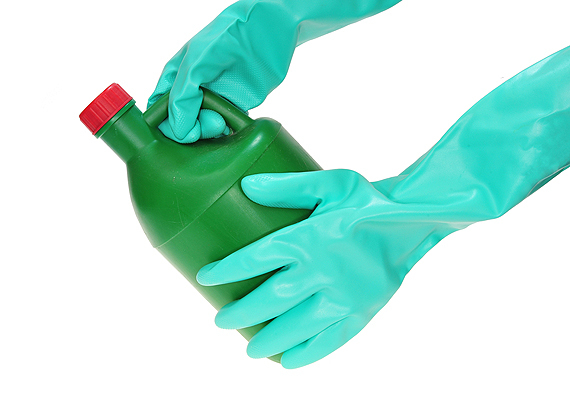 Wear eye protection and rubber gloves when handling liquid chlorine bleach. Never mix liquid chlorine bleach with other household cleaners! It will react with many common household products (including toilet bowl cleaners, rust removers, vinegar, acids, and ammonia based products) and produce highly toxic chlorine gas or other toxic chlorine compounds. There are some bleach products on the market that do not contain sodium hypochlorite. Make sure you use only regular sodium hypochlorite based bleach without additives. Do not use scented bleach! It is not approved for consumption. Non-sanitary well caps and poor drainage around well casings are two common potential sources of bacterial contamination that well owners can fix. Inspect your well cap to determine if it is a sealed “sanitary” cap or an unsealed “non-sanitary” cap. A sanitary well cap has one or more rubber seals and a screened air vent. Inspect the ground around the well casing for depressions or open holes that may be allowing storm water to soak into the ground around the well. Fill any holes and grade the surface so that water drains away from the well. Use clay soil, not sandy or gravely soil for these repairs. Step 1: Store some water for use while disinfecting the well system. If you have concerns about the effects of bleach fill several clean containers with water for use in washing dishes, flushing toilets, etc. Do not use this water for drinking unless it is boiled for at least 5 minutes. Step 2: Disconnect or bypass any treatment systems. If you have a water softener, filtration system, or other water treatment unit, it is best to bypass these systems when disinfecting your well system. Consult the treatment system manufacturer or supplier to find out if bypassing the system is necessary, and if so, what the procedures are for doing so. Recommended amounts of bleach for well disinfection: Amount of laundry bleach (5.25% chlorine) required for each 100 gallons of water equals 3 cups. 1 cup equals 8 ounces, 2 cups equals 1 pint, and 4 cups equals 1 quart. Step 3: Prepare a solution of bleach and water to pour inside the well casing. Referring to the table; mix the recommended amount of regular (unscented) liquid bleach containing sodium hypochlorite with water. Use a clean five-gallon plastic bucket (not metal), adding no more than ½ gallon of bleach per 5 gallons of solution. Mix several batches of solution if more than ½ gallon of bleach is required. Step 4: Pour the bleach solution into the well and mix it with the well water. Remove the well cap and pour the 5 gallon bucket(s) of disinfection solution into the well, taking care to pour the solution down all sides of the well casing or piping. Run a hose from the nearest outside tap to the well. Allow the hose to run on the ground until you smell chlorine. Then place the hose into the well casing and rinse the inside of the well with the disinfection for at least 5 minutes. CAUTION: Never pour pure (concentrated) liquid chlorine bleach directly down your well, the liquid is corrosive and can damage the well system. If you see exposed (un-insulated) wires, connections, or the ground wire is not connected, it is recommended that you have a well service company or electrician inspect the wiring to make sure it is safe prior to disinfecting the well. Step 5: Fill your distribution system (water lines and fixtures) with the chlorinated well water. Start with the fixtures closest to the well, run water through every tap in the water system, including all inside and outside faucets, tubs, utility sinks, showers, and toilets, until you smell chlorine. Include both hot and cold water taps in this process. Let the chlorinated water sit in the lines for 12 to 24 hours. CAUTION: Do not use the chlorinated water for pets, houseplants, bathing, or clothes washing! It is important to run the chlorinated water through each and every line in the system. Leaving even one line out of the procedure can allow contamination to remain in the system. Step 6: Flush the well system of chlorine solution. After 12 to 24 hours flush your well and distribution system. Starting with the outside taps; run water until you can no longer smell chlorine. Discharge the used chlorinated water in a safe place outside. Avoid lawn areas and other areas where the solution may kill plants. After draining the outside taps and flushing the chlorine from the well casing, flush the inside taps and fixtures. The smaller amounts of chlorinated water left in the inside lines and fixtures should not hurt your septic system. Never discharge the chlorinated water into streams, ditches, lakes, or ponds! Step 7: Retest your well for coliform and/or E. coli bacteria. After using the well for about 5 days submit a water sample to an approved laboratory for total coliform and/or E. coli bacteria analysis to confirm that disinfection has been complete and that the water is suitable for drinking. Prior to retesting consider drinking bottled water in case the well water is still contaminated. In severe cases or if the above procedures are not followed carefully, your well water may continue to show bacterial contamination. If this occurs carefully repeat these procedures and retest the water again.